Guys, less than a week till Christmas. Are you ready? Maybe you're Jewish and don't celebrate Christmas. If that's you, let me say first Happy 4th night of Hanukkah, and second, I have recently developed a crazy intense love for latkes, and for a non-jew the amount of them I've managed to get my hands on in the last week is pretty remarkable. Seriously making me question my catholic upbringing. But anyway, chances are regardless of what holiday you celebrate, you'll probably be attending some festive gatherings in the next two weeks. Lucky for you, I've got the perfect dish. I've had a long time fascination with sweet and savory things that don't seem like they'd fit together, but surprisingly pair quite fantastically, making you question everything you thought you knew. For me this is sharp cheddar and apples. Sure they could work together on a cheese plate, but what about all stewed up nice and steamy in a rustic galette? Even better. For those of you who've never had the opportunity to throw together a galette, or who might not know what it is, it's basically a rustic, no-fuss, much easier version of a pie. No crimping the edges, no rolling out perfectly round measured circles, no covering the crust with tin foil (ain't no body got time for that), and no nervous transferring of a crust to a pie dish. You just mix up your dough, roll it out (and seriously the more imperfect the better here) and throw whatever kind of fillings you like inside. Fold up the edges, again imperfections here add to the rustic-ness, and pop it in the oven. No fuss. The result is handmade and charming. And the apples and cheddar? They make quite the dynamic duo. And along with toasty caramelized shallots and winter herbs this thing comes out of the oven smelling super cozy. But even though the filling is great, I still think this crust is my favorite part. It's flakey, buttery, with just a the perfect hint of pepper and parmesan. So far this season I've cooked it up for Thanksgiving, a weeknight dinner, and the holiday potluck we had last weekend. Make the dough. Pulse flour, cornmeal, salt, pepper and parmesan in a food processor until combined. Add frozen butter chunks and parmesan and pulse until butter breaks up to the size of peas. Add 1/2 the water, pulse, add the other half, pulse, then add the olive oil and pulse until cohesive dough forms. Transfer the dough to a lightly floured work surface and knead 2-3 times, form into a disc, wrap in plastic, and refrigerate for 20-30 minutes and up to two days. Meanwhile, heat some olive oil in a small skillet, sauté shallots over medium low heat for 10-15 minutes until soft and golden brown. Set aside. Finely shop thyme and rosemary and mix with salt, set aside. Preheat the oven to 375 degrees. Assemble the galette. Cover a flat work surface with a large piece of parchment and lightly dust with flour. Roll out the dough to a 14" imperfect circle - seriously, keeping it a little uneven, with jagged edges adds to the rustic feel. Top with cheddar, leaving about 1/2 inch boarder on all sides. Top cheddar with shallots and 1/2 of the herb salt mixture. Top with apples - I layered mine in two overlapping rows but you could do any design you'd like. Sprinkle with remaining herbs. Using a bench scraper, fold uncovered edges of the galette over. 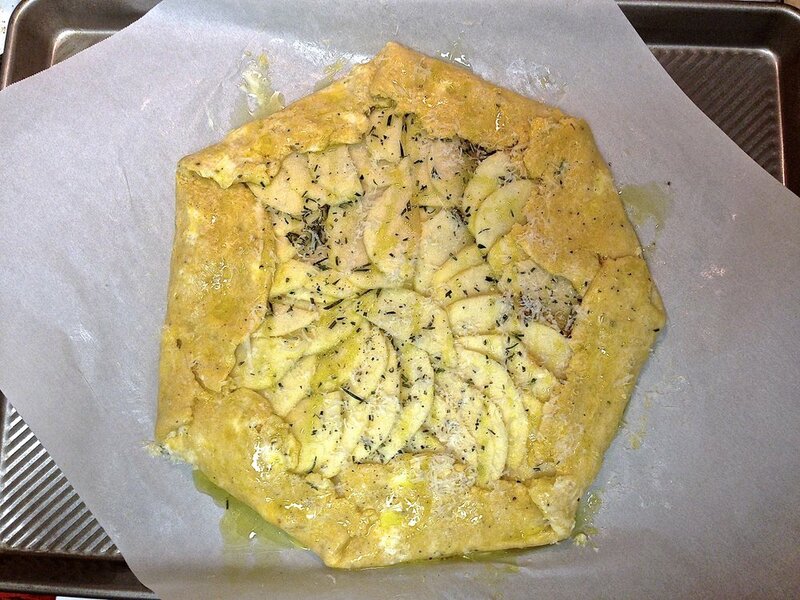 Whisk egg and brush crust with a liberal amount of egg wash. Drizzle entire galette with olive oil, freshly grated parmesan, and salt & pepper. Transfer galette, keeping it on the parchment paper, to a large baking sheet. And cook for 50-60 minutes until the crust is golden brown. Let cool about 10 minutes and serve. The galette is just as great at room temperature as it is warm. Reheats best in the toaster oven.